Three days before Edward and Sarah Poole signed the land over to the government, a surveyor named Isaac Sexton prepared a plat of the site (Records of the Office of the Chief of Engineers [ROCE] Land Papers) (see above). Sexton depicted the newly built earthwork and an unidentified structure, perhaps rudimentary barracks or a traverse, standing directly behind it. 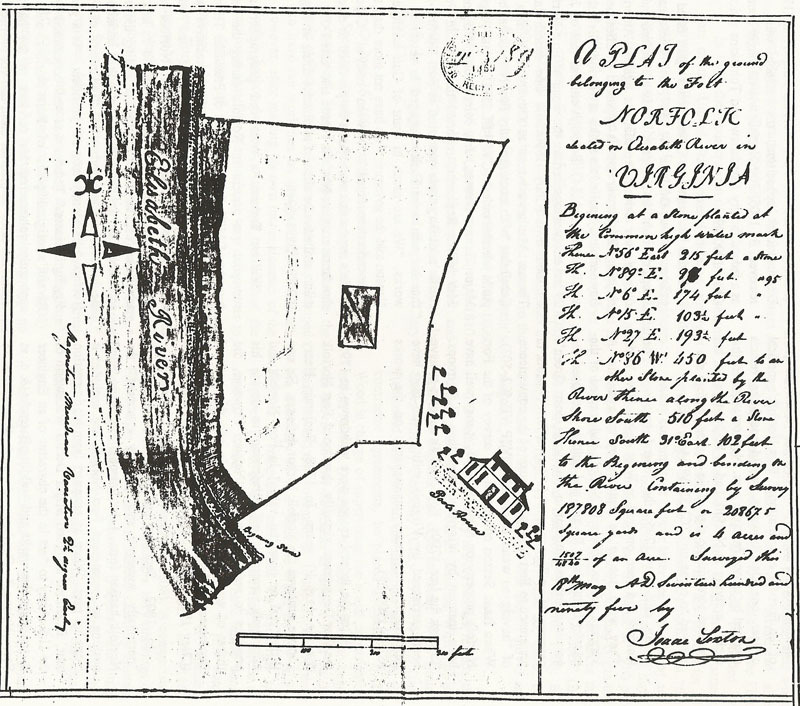 He also delineated the boundaries of the "ground belonging to the Fort" and added a sketch of the Poole residence. Sexton indicated that the house stood amid a cluster of trees less than 100 ft. outside the original southeast comer boundary of the Fort Norfolk property (see above). Considering the nineteenth-century adjustments in the boundary and the subsequent twentieth-century additions of small adjacent tracts of land, it is probable that the site of the Poole house now falls within U.S. government property at Fort Norfolk. It is not certain when the Poole house was built or when it was demolished. It may have been razed during the extensive improvements made on the fort during the years 1808-1810, or perhaps during the War of 1812, when advance positions were constructed to protect Fort Norfolk from land assault. At the time of the Sexton survey, Fort Norfolk was completely open to the rear. Isaac Sexton's 1795 rendering was the only eighteenth-century illustration of Fort Norfolk located during the research of Fort Norfolk's history. From Sexton's drawing, the Fort Norfolk of 1795 might be described as a rampart "en cremaillere" with demibastions at each end. Historian Willard B. Robinson defines the term "en cremaillere" as denoting "an angle or series of angles forming an orderly zigzag line." A demibastion is in effect a "bastion with only one face and one flank" (Robinson 1977: 198) (see above). Fort Norfolk was constructed almost entirely of earth. Clary describes the original Forts Norfolk and Nelson as "two unimposing earthworks" (Clary 1990:24). Secretary Henry Knox had warned Rivardi that "owing to the lowness of the estimates," there was no alternative construction material. Knox suggested that the "parapets may be faced with strong timber." He also recommended that the exterior of the forts be covered with sod "and the seed of Knot grass sown so as to bind the earth and sods together." Embrasures, or splayed gun openings in the rampart, "would suffer from the explosion of the powder from the cannon." Knox suggested that "the embrasures ought to be framed with joist and faced with planks of two inches thick" (CVSP VII:93).